To cool a PC chassis efficiently you need a fan which achieves a high air flow rate at a low speed. In contrast, coolers and radiators require a fan with the highest possible static pressure in order to push the air through the fins. With the new Twister Pressure, Enermax presents a fan that is specially designed for heat sinks and radiators. Together with the high-speed model Twister Storm, which will be introduced in the second quarter 2014, Twister Pressure completes the fan portfolio of the premium manufacturer. 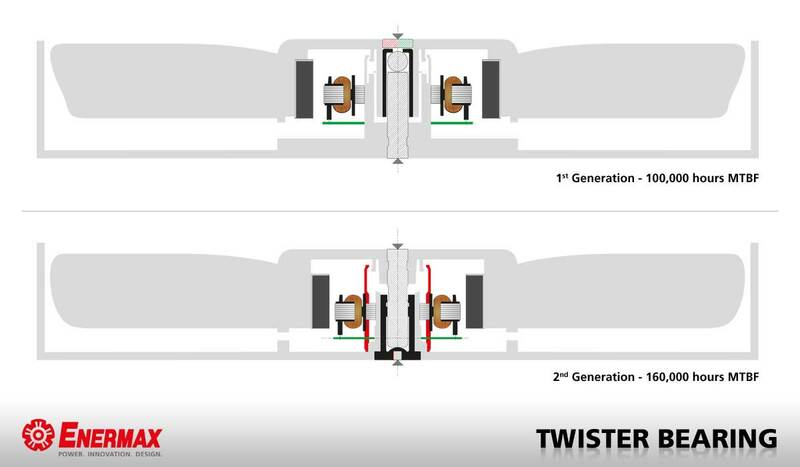 We have spent two years to create the new high-performance fans that are based on our patented Twister bearing. Initially, we quickly achieved good results by applying a robust frame construction and performance-capable fan blades. But during the long-term tests, we recognized that we are reaching the limits of the Twister bearing if we run a fan with more than 3.000 RPM. Therefore, it was inevitable to optimize the Twister technology. The result is impressive: The second generation of the Twister bearing offers 160.000 hours MTBF lifetime – 60 per cent more than the original version. We have found out that the principle with the metal ball is not suitable for high-speed scenarios. Dust and microparticles will be accumulated around the ball and slowly lead to corrosion – especially if you do not make use of the possibility to detach the fan blades and clean them. At more than 3.000 RPM, we would not be able to keep the promise of 100.000 hours MTBF for our fans. We were faced with the decision to correct the lifetime statement for our new high-performance fans or to advance the bearing. At the end, Enermax has opted for the redesign. While the basic functional principle remains unchanged, the bearing setup has been reverted: The magnet has been implemented into the base of the bearing and the shaft is fixed to the rotor. When you turn the fan on, the magnet is holding the shaft in position. With the convex surface of the base, Enermax reduces the frictional resistance and ensures a consistently silent and smooth fan rotation. The sleeve is made from a self-lubricating material and prevents the bearing from draining and corrosion. Another useful feature of the Twister fans is the so-called “Click Mechanism”: Over a longer usage period, a fan will be covered with dust which will significantly influence the performance and lifetime. Already with the first Twister fan generation in 2008, Enermax has introduced a smart innovation to overcome this problem: By pressing the rear side of the blades, you can detach the rotor and clean it from dust. Also the new optimized Twister bearing supports the “Click Mechanism”. Visually, the vigorous Twister Pressure significantly varies from the other Enermax fans: The reinforced black frame and the nine performance-capable, black-transparent blades are made from heat-resistant, quality materials. Twister Pressure is designed for extreme environments with up to 85°C operation temperature. Also the test results of the new Enermax fan are impressive: Already at 1.200 RPM, the 120mm model achieves a static pressure of 1.709mm-H2O – while the most powerful case fan from Enermax, the Cluster Advance 120mm, requires 1.500 RPM to reach this value. At the same speed level, the Twister Pressure surpasses the static pressure of the case fan by up to 37 per cent. On the other hand, it is hardly surprising that the air flow rate is lower than the Cluster Advance as both models are designed for different fields of application. Twister Pressure comes with the new APS function (“Adjustable Peak Speed”) which allows for an individual speed range setting in three steps: Ultra Silent Mode (500 – 1.200 RPM), Silent Mode (500 – 1.500 RPM) and Performance Mode (500 – 1.800 RPM). That way, users can flexibly adjust the cooling performance according to their system’s requirements. Within the selected operation mode, the fan is controlled automatically via PWM. The Twister Pressure 120mm fan (UCTP12P) is now available for sale at a MSRP of 11.90 Euro incl. VAT. More technical information and specification: www.enermaxru.com/twisterpressure.